I'm so excited you are thinking of training for Lake Placid! This little town boasts one of the most iconic venues on the circuit. Racing here is truly an accomplishment and an incredible experience. By being on this page it means you are looking to really test your limits and strive towards your goals. I believe you have so much potential and with the right approach and mindset, nearly anything is possible! You'll receive daily emails with workouts along with various resource guides that are spread throughout the program to help you plan, train, and execute with the right mindset and perspective. The weekly focus will help keep you motivated and intentional, while the weekly review will help you build confidence with all the things you're doing well and hone in on the areas you can grow. - This set will establish your Threshold. Swim 1000 yards/meters at a constant pace and good effort—as if racing. Record the time and average pace per 100 during the 1000 TT. This is your threshold pace - input into Training Peaks settings to calculate appropriate Training Zones. Great idea to set a "process" goal here. Focus on pace per 100 or overall time for your next 1000 TT. - 20 minutes @ 105% of current or estimated FTP. Start steady, slight build, but pushing much higher at end indicates too low of effort in the beginning. Notes: Average power output and average HR during 20 minute portion. FTP = (.95)x(average power) and Functional Threshold HR is simply your 20 min average. If this is a start of a new season, set your estimated FTP slightly below (15%) your last seasons FTP due to time off unless you've been training consistently. It's better to underestimate at first and build into it. This is a key workout! Find pump up songs and motivational mantras to push through the final 5 minutes. Will test for increase later on. - 30 minutes @ Threshold. Start a little slower around Sweet Spot effort and then increase effort and pace as you go. - Average pace for ENTIRE 30 minutes is your Functional Threshold Pace. Easy day @ aerobic effort. Notes: The purpose of this workout is two-fold. 2. Active recovery from the first part of the week. No need to push these workouts, in fact that is counter productive. The goal is to create consistency and adapt the body to training stress over the duration of the training program. Recovery Ride: Optional recovery ride today with a few hard 30s intervals mixed in. 30s intervals are fantastic way to build mitochondrial density without adding too much stress and can break up an otherwise monotonous training session. I believe in the power of human potential. 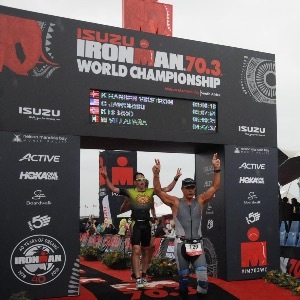 As an IRONMAN Certified Coach and RYT 200 Yoga Teacher that combines the art and science of training, I can help you break through that next barrier and achieve your dreams. Whether that is through the general guidance of a Training Plan, specific instruction via remote Coaching, or even weekly and daily motivation through my newsletter and social media, my goal is to help you accomplish yours!